What would you give to be a fly-on-the-wall at the greatest gathering of hitting minds in the college game? Well, you can – here’s how. As you read this we’re in the middle of our 4th Annual Pitching Summit and 2nd Annual Hitting Summit. 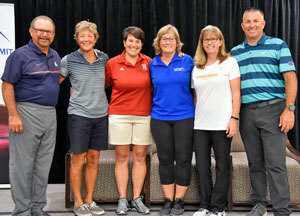 These Summits are intense gatherings of the best minds in college softball, spending 3 days immersed in the details it takes to get their players ready for the upcoming season. And while these events are only open to college coaches – now you can be there too! We’ve just released the Hitting Summit Vault which contains every presentation, panel session and micro-topic held during the 2017 Hitting Summit. The Very Best Coaches are the Very Best Learners! You Can Never Share Too Much! Knowing doesn’t make you successful, executing does and that’s why the very best coaches are not afraid to share everything they know, because it still comes down to which team can execute what they know the best. Make things go wrong in practice and get screwed up – that’s what happens in games and our job as coaches is to prepare our players to succeed in games. I used to want my practices to look good, but I realized I really want my team to play good in games. We need to do less talking as coaches and far more listening. Especially with our freshmen. The stronger their grip, the faster their bat speed and the faster their throw. The front foot has to be down by the time the ball is ½ way to the plate. The Wider the hitter’s stance – the more she’ll get back in her legs during the load. The Narrower the hitter’s stance – the more she’ll get down in her legs during the load. We make almost no mechanical changes with our hitters in the fall. They’re already overwhelmed, and we just want them to settle in and get comfortable. Most hitters are on time or early, they’re rarely late. If your hands get outside the elbow during the swing, then you can only swing around the ball. Teach your players how to breathe to relax, versus breathing to survive! Slapping must start with the Bunt. Once the slapper can bunt you can teach her to soft slap and eventually hard slap. You want your slappers to get to 1st base in 13 or fewer steps! At contact, your slappers should have their nose over their toes – we never talk about their front shoulder. A swing and a miss is just a strike! We teach power and we know that with that will come swings and misses. We don’t teach them to swing and miss but we also don’t freak out when it happens. We talk a hitter’s strengths more than her weaknesses. Players want to talk and focus on their negatives on their quest to perfection – and you won’t be perfect in softball. Focus on your strengths! If you change anything with a hitter – don’t take away what they’re good at! I care about: do they swing at strikes and do they take balls. Shrink the reps and get more quality. Instead of 20 pitches in batting practice, take 3 and then switch with a partner. When the zone is wide don’t let it hurt your early count hitting – only adjust to the umpire’s zone when you have 2 strikes – otherwise you’re swinging at pitches you can’t hit well and shouldn’t be trying to hit. Become a Hitting Summit Vault member & start improving your hitters Today! Want to super-size that and add the Pitching Summit as well, then check out our Combo Summit Vault!